One of the most helpful tools is the driver's ecosystem. This system is built with a 12.3-inch screen, and a ton of information about the BMW X5 is projected on the display. 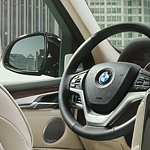 Next to this unit, you'll find iDrive, which is a console that enhances your driving experience. The entire layout can be customized, and the interactions have been upgraded to make iDrive easier to use. Other tools are also included, such as Lane Departure Warning, Frontal Collision Warning, Active Driving Assistant, and more. If you want access to great driving tools and helpful safety solutions, the BMW X5 is an ideal choice. This vehicle will begin to provide benefits the moment it leaves the lot because its strategic Traffic Jam Assistant tool and Automatic Lane Change hardware provides big advantages on the highway.